Can we teach elementary school students to understand what they’re reading? How early can we start teaching students comprehension strategies? When should students start reading informational texts? We absolutely CAN teach elementary school students to read for comprehension. The question is, in what grade? Research supports that as early as in kindergarten, students can start effectively using comprehension strategies, reading informational texts, and understanding what they’re reading. Mind Mapping for Kids helps elementary school students — even those in kindergarten — develop higher-level thinking and improve their reading comprehension using mind maps and the 8 reading comprehension strategies. The book is intended to be used in conjunction with other literacy instruction programs. It can be a catalyst for the use of mind maps and comprehension strategies and a complement to instructional techniques already in use. 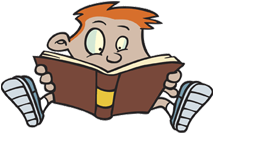 We read to get information and ideas, to enjoy stories, and to attain new knowledge. To do any of those, we need to comprehend what we read. Reading is a complex, interactive, personal thinking process that involves making meaning from what we read. The meaning comes from relating what the author is trying to communicate with our knowledge, experience, perspective, and purpose in reading. Reading requires critical thinking and critical literacy skills, such as reflecting on what you’re reading and making connections between what you’re reading and what you know and feel, especially as the text gets more complex. Reading comprehension is essential to student success, not just in the context of school and exams, but, more importantly, for lifelong success. Helping students learn meaningfully is a teacher’s most important goal, as it is a process students will use to facilitate their lifelong learning. 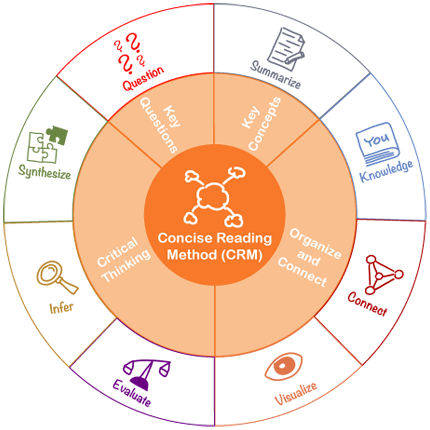 CRM is a reading method that aids reading comprehension using mind maps and the 8 comprehension strategies. It’s a method used by students and teachers to construct meaning from narrative and informational text and then sustain and refine those understandings. Mind maps are visual maps of information where associated concepts (subtopics) branch out of a central topic. When mapping, learners break apart complex information into key concepts, which they then place into a map where all of the listed concepts are connected. The process of placing information into a mind map changes that information in that the learner has made decisions about what concepts to highlight and how to connect them. To compose a mind map, comprehension must take place. Mind maps work so well because they move in all directions, mirroring the way our brains work. CRM improves student performance and meets curriculum standards by integrating the 8 comprehension strategies with mind maps. Standards that are met with the 8 comprehension strategies can be found here: http://reading.ecb.org/teacher/standards.html. Information on how core standards are met with mind maps can be found here: http://www.inspiration.com/Standards-Matches/Inspiration/. 4. If you like what you see in 1-3, read the book. 5. Put what you’ve learned into practice and share your experience. I welcome all questions and comments. You can contact me at profTK@ConciseLearning.com.